The hunt for a husband in Regency England was a serious business and upper class families invested large sums of money to give their daughters a ‘season’ in London. An unattached woman had no occupation other than to find a husband but on no account must she signal that this was her goal. It was the single man wanting a wife who must do the work of wooing and winning according to a strict code of conduct. The code protected the woman’s reputation but also prevented the man from becoming ensnared against his will. The prohibitions put upon the unmarried were many. Before an engagement, couples could not converse privately or be alone in a room, travel unchaperoned in a carriage, call one another by their first names, correspond with or give gifts to one another, dance more than two sets together on any evening or touch intimately – and that included handshakes. Greeting and leave taking were acknowledged with a slight bow of the head or curtsy. So in a period when propriety was so strictly policed, how did courtship ever progress? Ways and means did exist for young men and women to interact and exchange smiles, sighs and becoming blushes. Private balls and public assemblies were ideal opportunities for couples to come together. Gloved hands could be held briefly during the dance and while walking to and from a set. Under the watchful supervision of their elders, the young and unattached could stand up with each other, demonstrate their gracefulness, their ability to converse intelligently and their compatibility. In similar fashion interested partners might become better acquainted on chaperoned walks in the countryside, falling behind the rest of the party if they wished to speak privately. When a gentleman was certain his feelings were reciprocated, he would ask permission of the lady’s parents to pay his addresses. A suitably private setting for the proposal could then be arranged. Most often he would be answered positively since it was very bad form for a lady to encourage an attachment she could not return. Occasionally an unwelcome proposal might be made despite her lack of encouragement, and then the lady would have to turn her suitor down but always with sensitivity to the man’s feelings. Once a proposal was accepted and parental consent was obtained, to break off an engagement was considered very grave. An engagement was seen as a contract. A gentleman was strictly forbidden from breaking an engagement once accepted and a lady could only change her mind after careful consideration. There were strict rules governing marriage. In order to marry legally, a couple needed a licence and the reading of the banns. They also required parental consent if either of them were under the age of twenty-one and the ceremony had to be conducted in a church or chapel by authorised clergy. The only way round this was elopement to Gretna Green in Scotland or if you were extremely wealthy, the purchase of a ‘special licence’ issued by the Archbishop of Canterbury which permitted the couple to marry at a location other than a church. Needless to say, either course of action was likely to create intense and often unpleasant gossip. 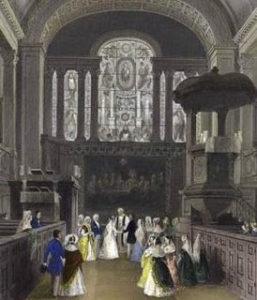 During the Regency, weddings were mostly private affairs and even fashionable weddings were sparingly attended. They were certainly not the huge affairs that we know today or that became more prevalent during the Victorian era. The bride might sometimes wear white but it was not considered mandatory. A coloured dress did not signify lack of chasteness but was simply a personal preference.